The study of group actions is more than a hundred years old but remains to this day a vibrant and widely studied topic in a variety of mathematic fields. A central development in the last fifty years is the phenomenon of rigidity, whereby one can classify actions of certain groups, such as lattices in semi-simple Lie groups. This provides a way to classify all possible symmetries of important spaces and all spaces admitting given symmetries. Paradigmatic results can be found in the seminal work of George Mostow, Gregory Margulis, and Robert J. Zimmer, among others. 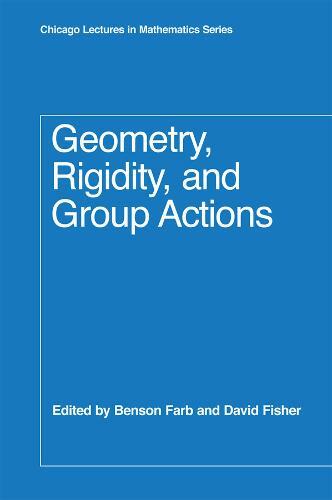 The papers in "Geometry, Rigidity, and Group Actions" explore the role of group actions and rigidity in several areas of mathematics, including ergodic theory, dynamics, geometry, topology, and the algebraic properties of representation varieties. In some cases, the dynamics of the possible group actions are the principal focus of inquiry. In other cases, the dynamics of group actions are a tool for proving theorems about algebra, geometry, or topology. This volume contains surveys of some of the main directions in the field as well as research articles on topics of current interest. "For those interested in learning about the subject of large group actions, sometimes described as 'Zimmer's program, ' this is a key book to own, and it fits well alongside the earlier rigidity books by Zimmer, Margulis, Feres, and Witte Morris. This is an extensive area of mathematics, with many subareas of research, and for those already familiar with parts of the program, this book will also prove invaluable as a guide to many of the latest developments."